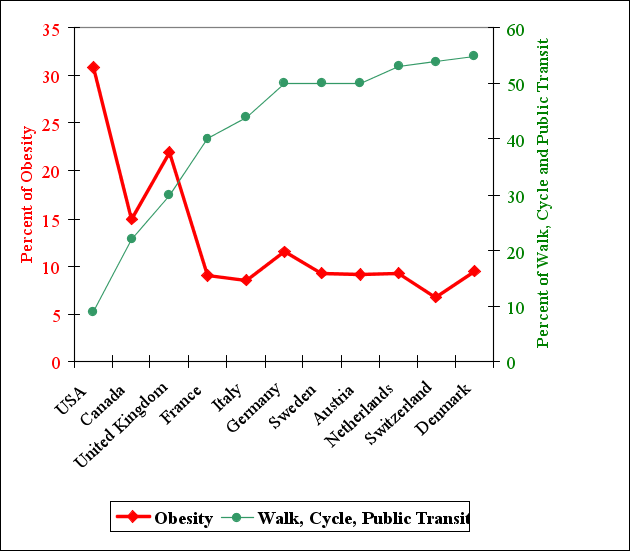 No Impact Man posts this interesting graph showing what happens when more of the population walks, cycles, or takes public transit: they are generally skinnier and healthier. Given that the alternatives to driving are all better for the environment, aid in the struggle for energy independence, and delay the impact of peak oil, Why do our planners and elected representatives even permit low density suburban development? Why do they not insist that everyone have access to good public transit? Why are there not bike lanes everywhere? One thing I go on about on this blog is how in many ways we benefit rather than sacrifice when we change our lifestyles and public policies in order to treat the planet more kindly (see here and here, for example). Because very often, making the planet more healthy makes the people more healthy, too. My little family and I have found this, for example, in eating unpackaged, local, seasonal and vegetarian (you can read why this helps the environment here). The result of altering out diet for the sake of the planet is that we eat no processed food and a lot more fresh fruit and vegetables. Our eating is much healthier than it used to be. 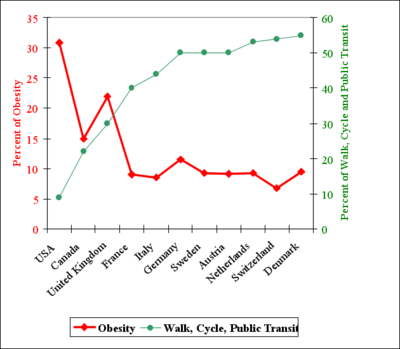 This graphic, provided by Transportation Alternatives, shows that similar benefits come from biking, walking and using public transportation. What it shows is that when we use our cars less--one of the most important things we can do to help the planet-- and other modes of transport more, we end up skinnier and healthier. Go figure. What's good for the planet is good for us, too.